We are proud of our support for young art in the local community. We believe that art is the only discipline that teaches creativity, good judgement and an understanding that problems do not have a single solution. 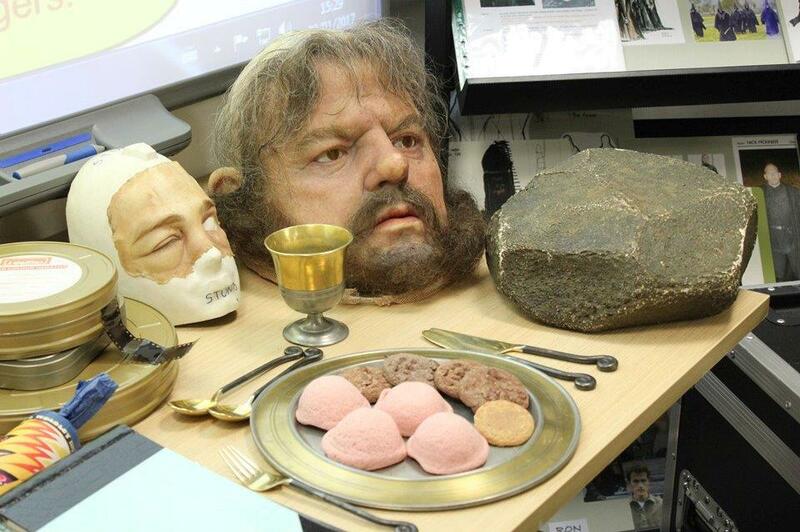 It is also hands-on and teaches children and students about the material world and it results in a physical object that they can be proud to own or, in some cases, the school can display for years to come. 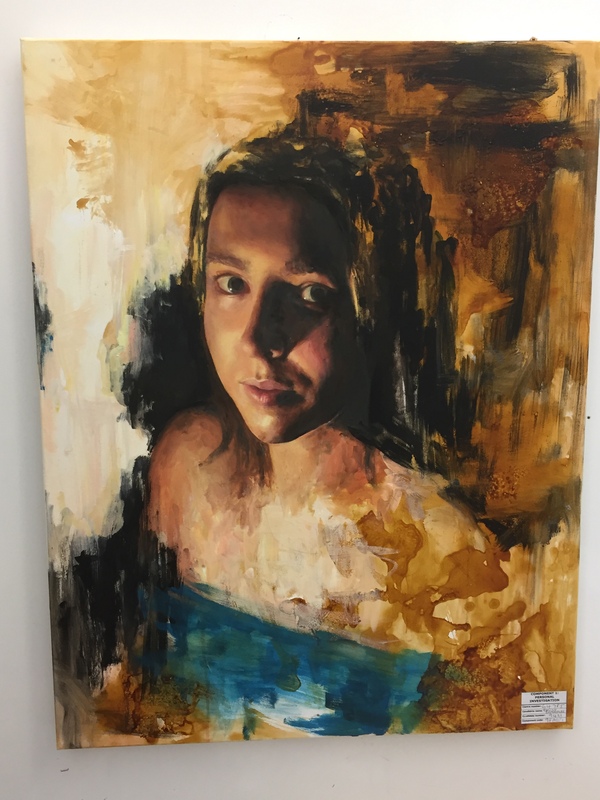 Some of the projects we have funded are shown below and it is always worth looking on the news page to find out about the latest success of our young artists. 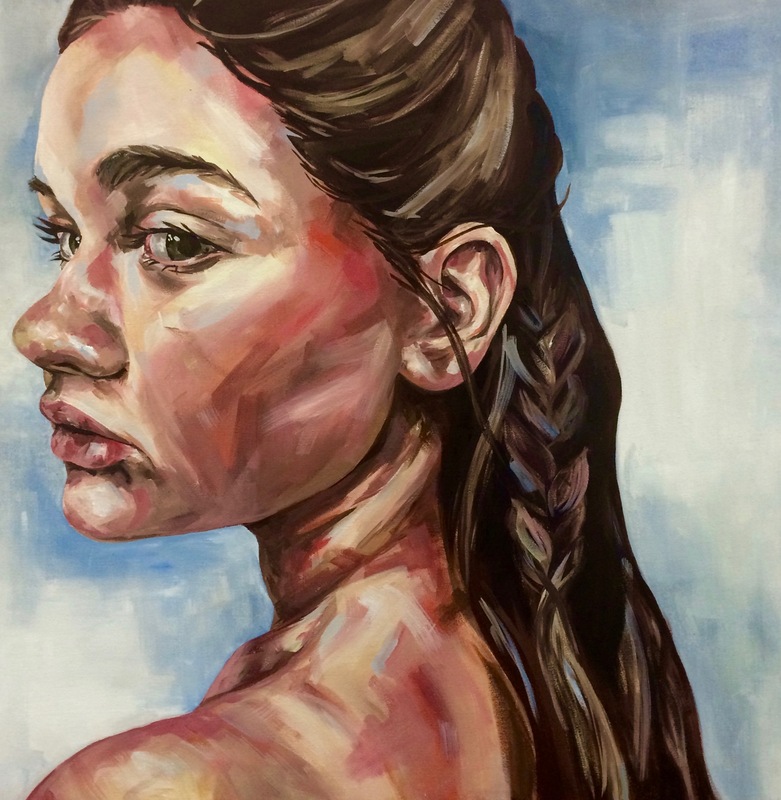 The Arts Society Walton has submitted the following A-Level artworks to the Royal Society of British Artists for possible inclusion in RBA’s 2018 Exhibition at the Mall Galleries, London. The chosen entries will be announced this autumn. 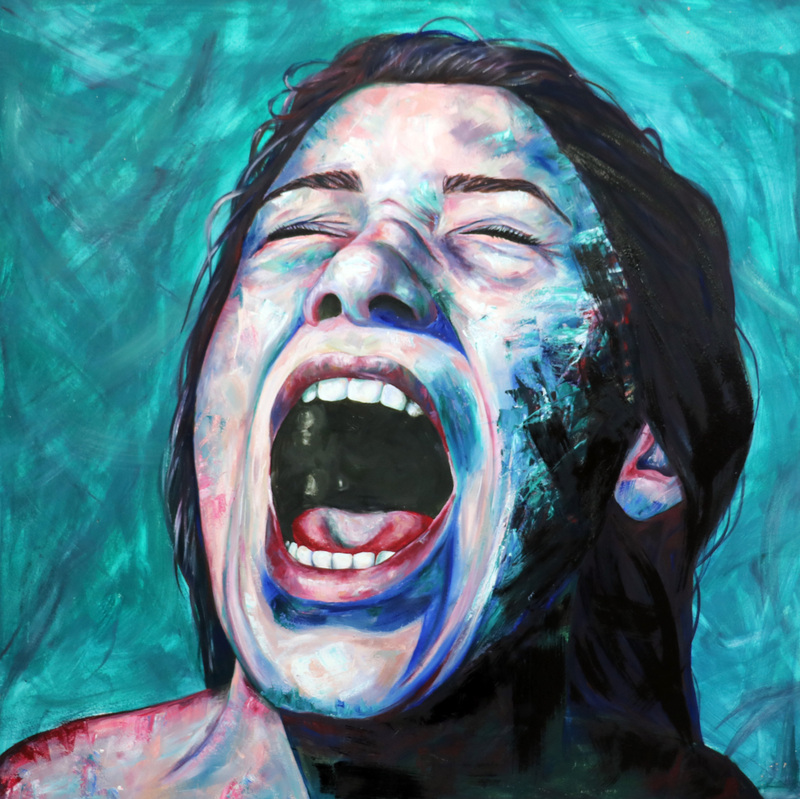 The following are the artworks we selected in alphabetical order by artist’s name. 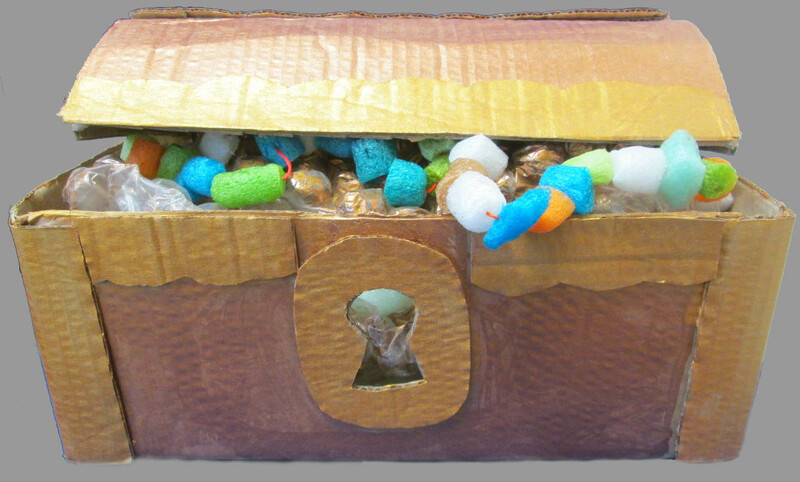 A group entry by Year 5 pupils from Burhill Primary School won the 8-10 Years Category. 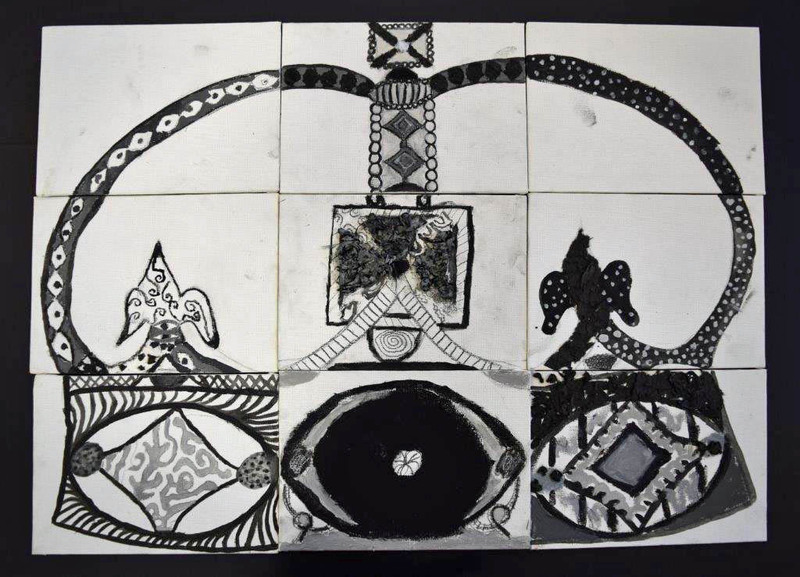 A nine-tile mosaic was created by Megan (age 9), Jack (10), Maciej (9), Amelie (9) Youssef (9) and Sophie (9). 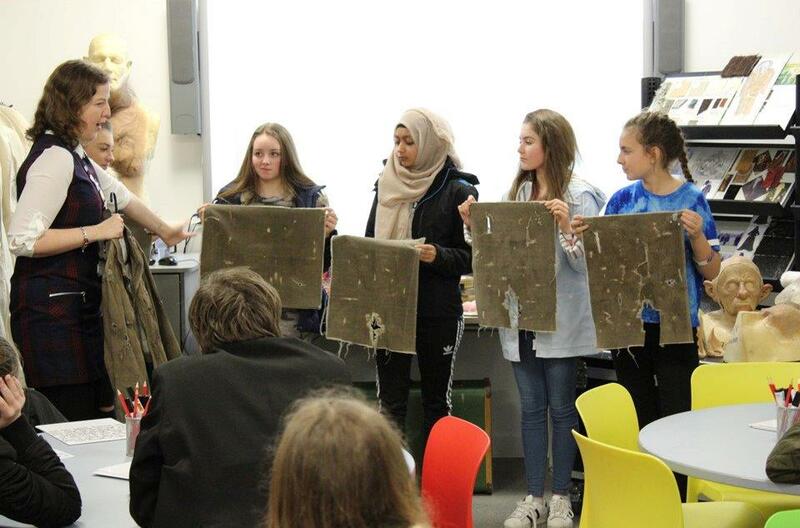 Enabled by our grant of £292, fifteen Year 9 students from Rydens Enterprise School spent an exciting day at Warner Brothers Studios touring the exhibition and taking part in the fabric distressing workshop. The objective of the trip was to stimulate interest in working with textiles among prospective GCSE students. 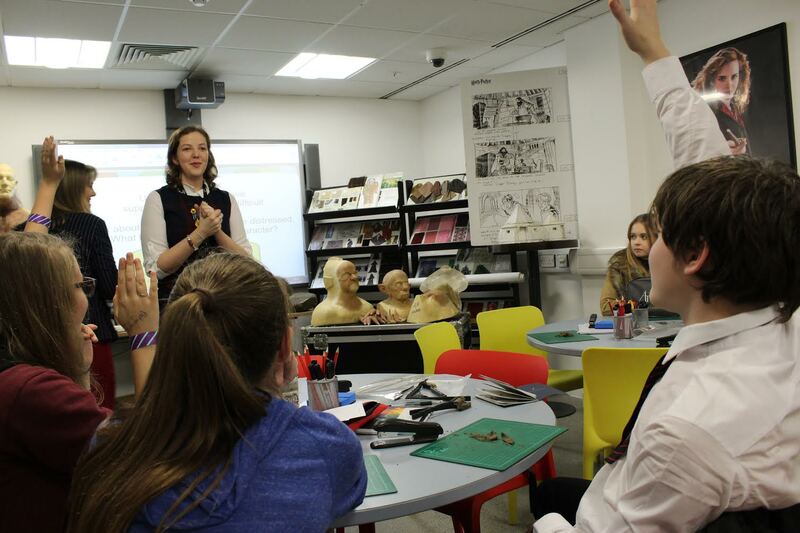 The 15 participants were selected by the school on the basis of a questionnaire designed to gauge their GCSE plans and their interest in arts subjects including design technology and textiles. 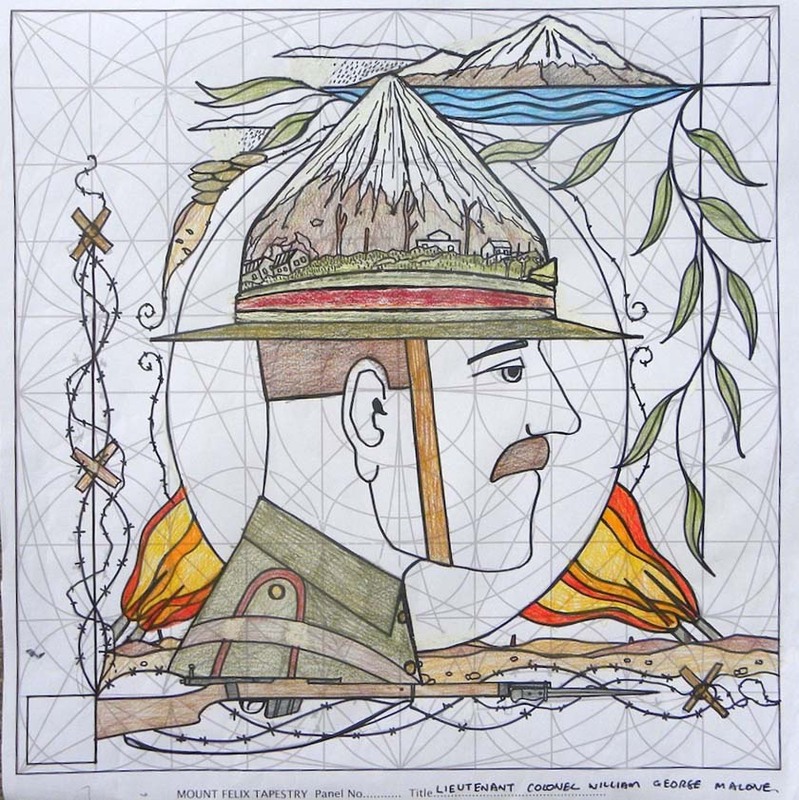 The Arts Society Walton has contributed £300 to a community stitch project commemorating the Centenary of the ‘No2 New Zealand General Hospital’ at Mount Felix in Walton on Thames where more than 27,000 NZ soldiers were treated during First World War. The project, organised by Riverside Arts Centre in Walton, involved the creation of a 40-panel tapestry depicting stories of some of the patients and nurses who passed through the hospital. 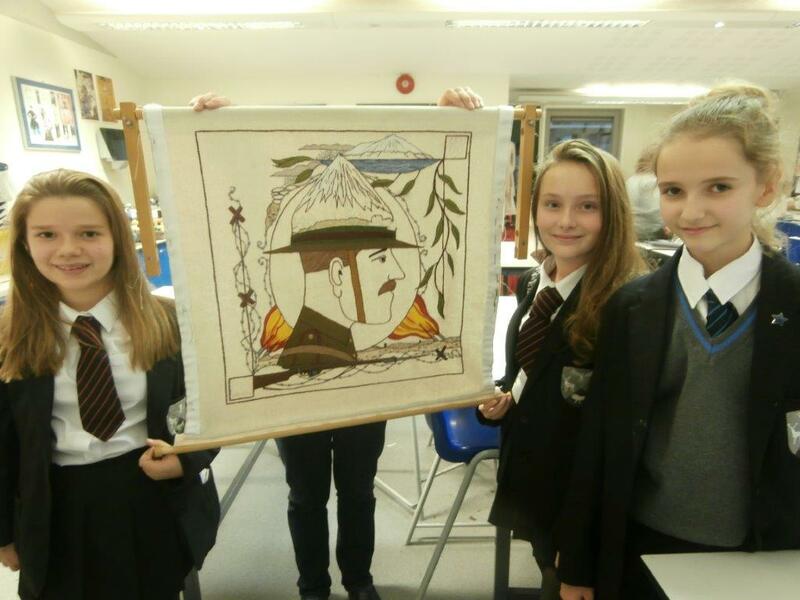 The panel was stitched by a group of Year 7 pupils attending Rydens Enterprise School in Walton; it features Lieutenant Colonel William George Malone wearing the distinctive ‘Lemon Squeezer Hat’. The children worked on the panel throughout 2016 at the after- school club, and the expertise they gained there has inspired some of them to venture into new areas of textiles. Their work will be on display at the Riverhouse Arts Centre alongside 39 other panels from 23rd April 2017. 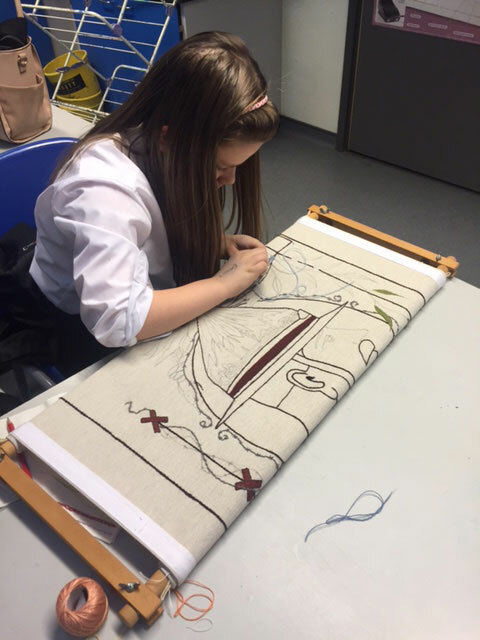 The photographs show Rydens School pupils at work from the first stage of learning basic stitches to the finished Slouch Hat panel. 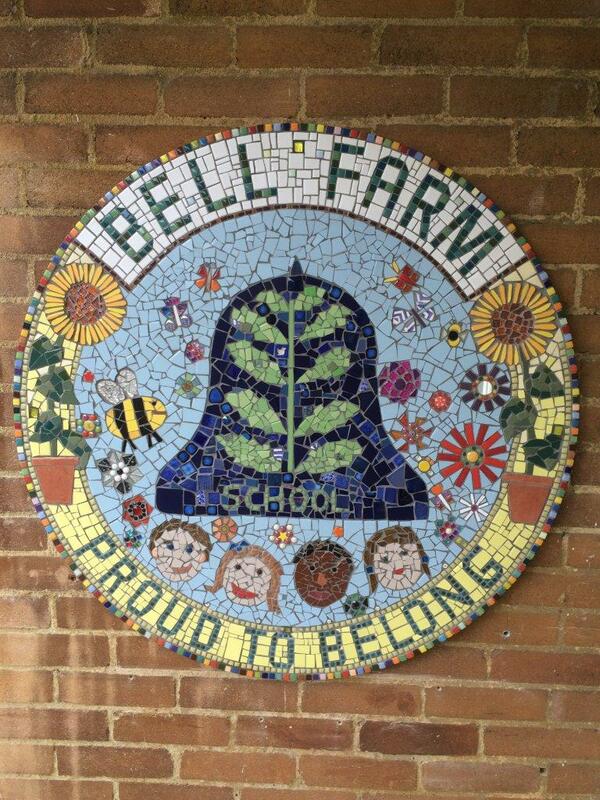 We granted £1,600 to Bell Farm Primary School in Walton to create a welcome mosaic for the main entrance to the school; the funding covered the cost of the design, materials and workshops run by mosaic artist, Sue Edkins (mostlymosaics.co.uk). Children from year groups 4, 5 and 6 were invited in June 2015 to create designs that, in their view, reflected best the character of the school. The work was set as an optional homework and produced a great variety of individual ideas and designs, most of which were incorporated by the artist in the concept design. 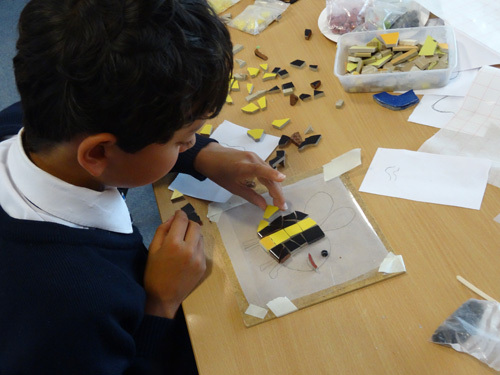 The work on the mosaic was carried out in September in three workshops attended by 16 of the keenest young designers who worked under the artist’s supervision in groups of two or four. For all of them it was their first experience of making a mosaic and they found it both challenging and very enjoyable: ‘It was the best hour of my life’, exclaimed one young artist on leaving her workshop. The completion of the mosaic was celebrated at a school assembly on 15th October 2015 and the work was unveiled the same morning by the Mayor of Elmbridge, Councillor Jan Fuller who praised the young artists for the beautiful and welcoming piece they had created. We provided £500 to fund one-term bursaries for Art Classes for children aged 5-16 at Riverhouse Arts Centre in Walton on Thames. The bursaries were aimed at local schoolchildren who are eligible for free school meals and who show a special aptitude for the arts. 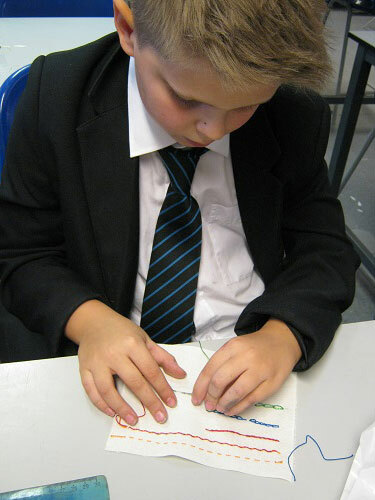 The first two bursaries worth £175 were awarded to pupils aged 6 and 8 from Burhill School in Walton; the pupils were given the opportunity to experiment with various materials including drawing, painting, clay work and craft work. We funded the bursaries for the school year 2015/2016. 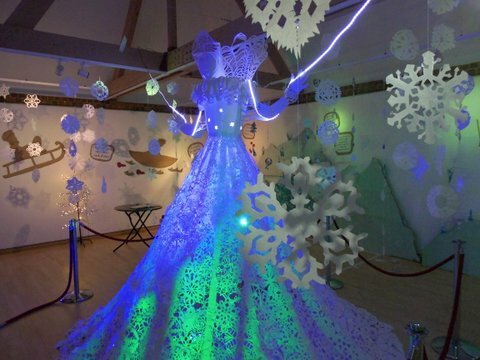 As only a part of £500 originally allocated for Young Arts at the Riverhouse was spent in the autumn term, our committee decided to contribute £325 towards the cost of running art workshops in local primary schools to produce snowflakes for the Snow Queen Christmas Exhibition at Riverhouse Arts Centre. 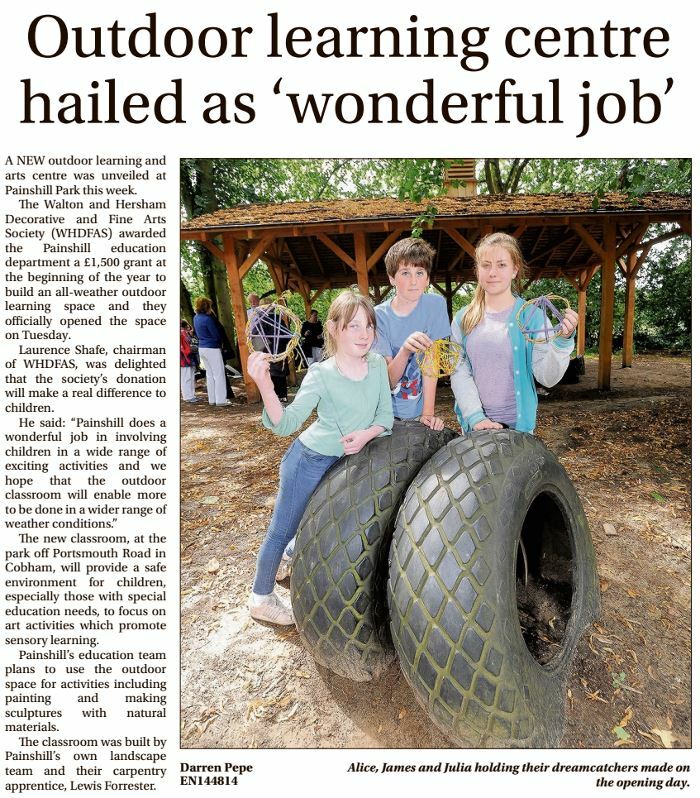 Darren Pepe, reporter at the Surrey Advertiser wrote the following report on the outdoor learning centre that we sponsored at Painshill Park. 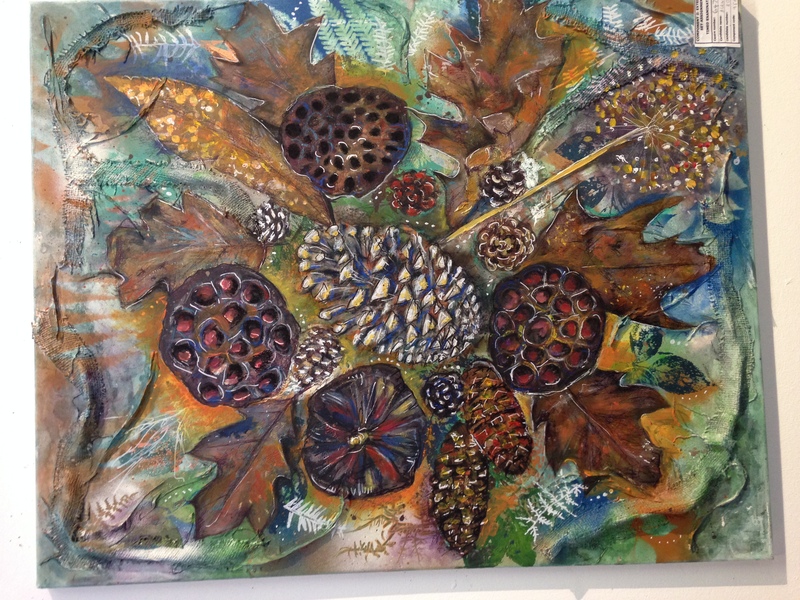 The Society helped fund an outdoor workshop in Painshill Park to enable children with special educational needs to engage in art projects in the open air. The shelter also creates an outdoor exhibition space for permanent and ephemeral art work created by children and young people. The covered outdoor workshop space is adjacent to the Education Centre and it enables children to access the great outdoors and take part in natural art workshops. It provides a permanent, usable, easily accessible learning space for children with special educational needs and mobility difficulties. Painshill’s historic landscape and crystal grotto form part of the learning experience and the aim of each session is to stimulate different senses by encouraging pupils to make pigments and paints using natural materials, digging clay for relief sculptures, creating and photographing collages on the forest floor and making charcoal to draw black and white pictures . Pupils also search for natural objects to make sounds and assemble a musical mobile using wire and their found objects. 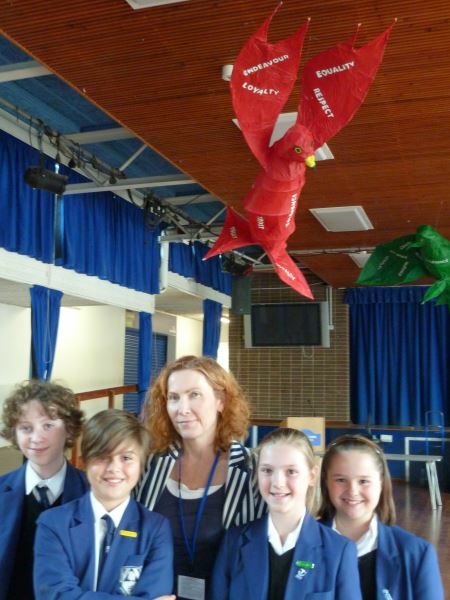 The visiting artist Dawn Curwen helped the children design and build balloon birds. The last project to be completed spanned Autumn 2011 to Spring 2012. All the children of St Charles Borromeo Primary School in Weybridge were involved in a joint Art and RE project called “In the Footsteps of Jesus”. 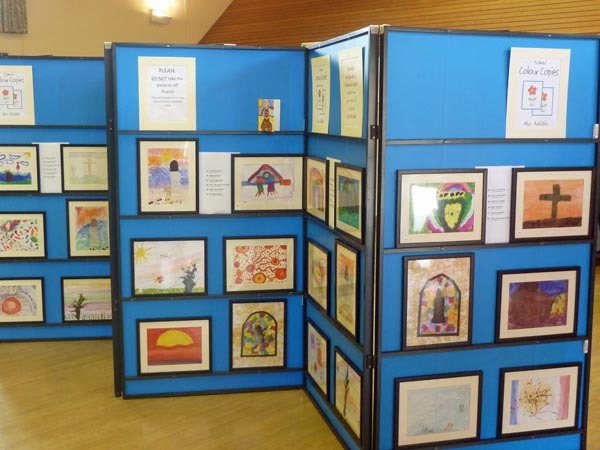 The project involved two parts; firstly a Prayer Book written and illustrated by the children which was published in November 2011; secondly an Art Exhibition which took place in March 2012. For each of these, expertise was required to enhance the children’s Religious pencil drawing and painting skills. We allocated this year’s Young Art’s Fund to buy in this expertise over the two terms. The Art Exhibition took place at the school and all the paintings were framed. 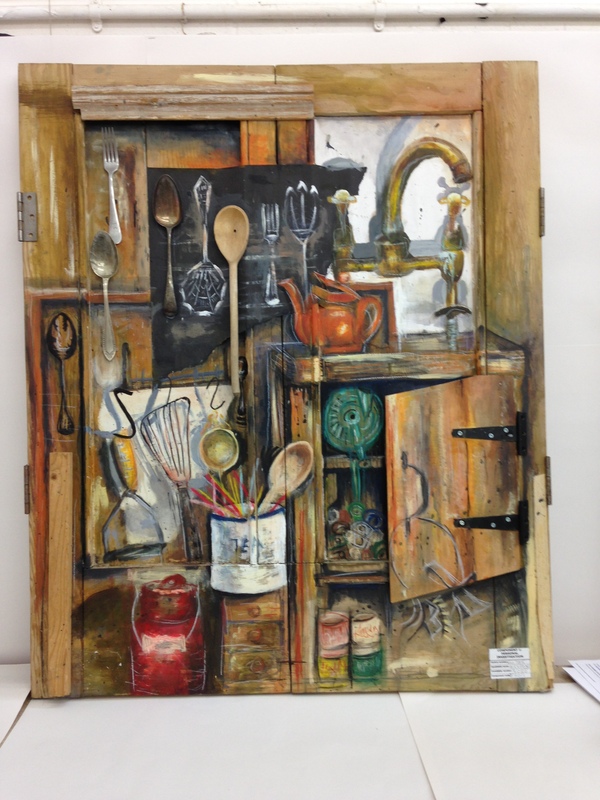 The school invited all members of the community, especially members of The Arts Society Walton, to visit the Art Exhibition. 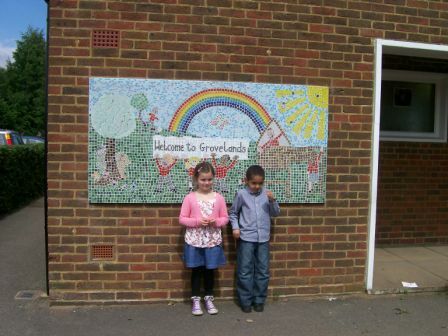 In 2010, Groveland’s Primary School in Walton-on-Thames was delighted to receive a grant of £350 from our Society to involve the children in some creative artwork. 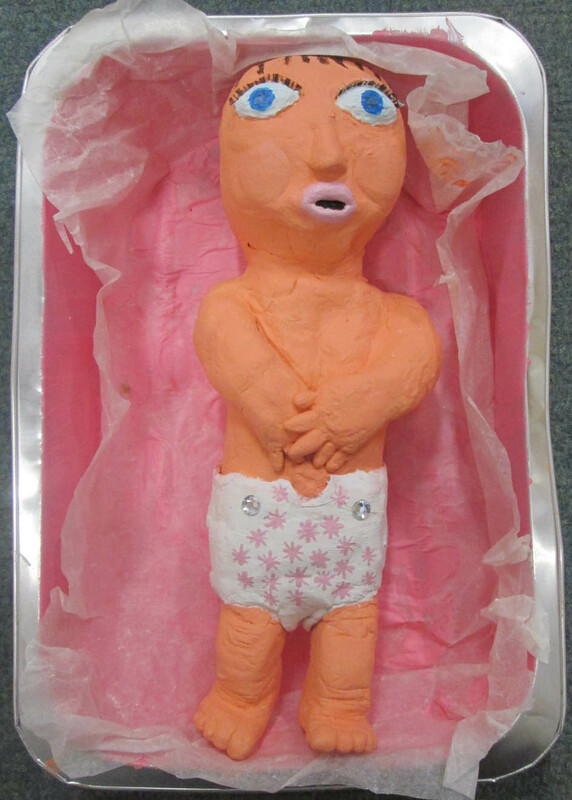 Jackie Brown, the school Art Co-ordinator, took charge of the project. After discussion with staff and children, it was decided that the art installation would be a welcome mosaic to be placed near the school entrance. Jackie Nash, a specialist in school mosaics, was asked to help with the project and children from the Reception and Year One classes painted pictures of what they would like to see in the mosaic. 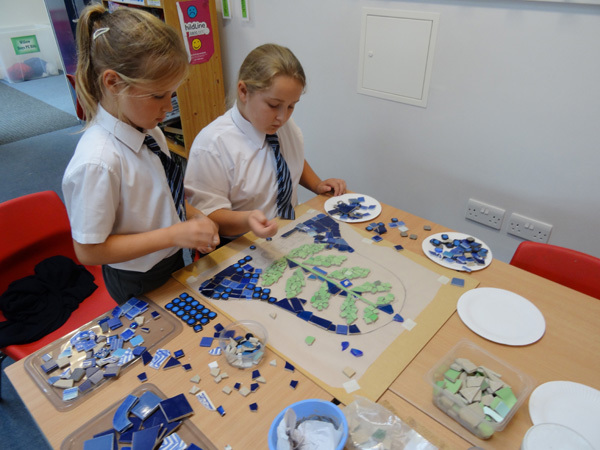 After a democratic selection of the most popular ones, Jackie Nash prepared the template for the mosaic and the children were then involved with placing the tesserae on the panel. Mounted next to the school entrance, it is colourful welcome. In 2009, Ashley Church of England Primary School in Walton on Thames received a grant of £350 from our Society to enhance the teaching of art at the school. 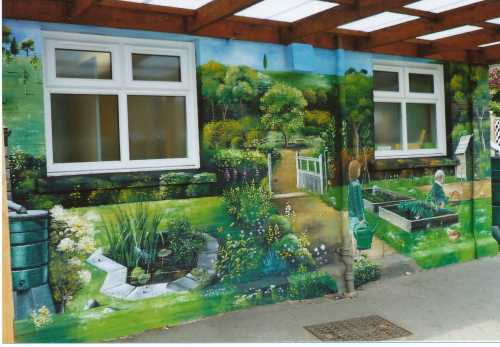 After discussion with the staff and children a decision was made to bring the school grounds behind the school to the front in the form of a mural. The intention was to have an immediate impact on the parents and children about the essence of the school and the things they do to make it a rich learning environment. This includes the secret garden, pond area, vegetable plots and the chickens. The children learned a great deal about the techniques used in painting a mural and it will also be used to stimulate writing, drama and poetry.